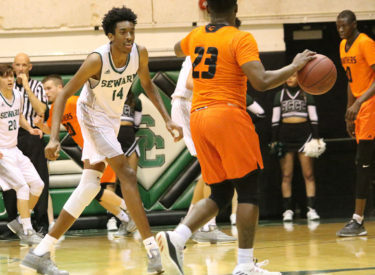 LIBERAL, Kan. – The Seward County men’s basketball team struggled to put another opponent away, slipping in the final minute to lose to Neosho County 86-83. In a night where the offense could seemingly do no wrong, it was the No. 1 ranked defense that faltered for the Saints. It was a sloppy start to the game, as the two teams combined for just nine points through the first six minutes of play with Neosho leading 7-2. The Saints went on a 9-2 run over the next three minutes to take the lead following an Isiah Small three-pointer. Just before the media timeout, the Panthers Austin Downing connected on a three-point play to give Neosho a 17-13 lead. The Saints (14-12, 10-12) prevented the Panthers from extending the lead any further, fighting back into the game to take a 25-24 lead with a Ke’Sean Davis put pack with six minutes to play. Seward extended their lead to 38-34 with a Davis three-pointer, but a scoreless final two minutes-of-play left the Saints down two points at the break, 40-38. Seward shot 50 percent from the field in the first half, connecting on 15-of-30 shot attempts. However, the Panthers managed to shoot 53.8 percent (14 of 26) from the floor and 50 percent (6 of 12) from deep. Back-to-back three pointers to start the second half put Seward up four points, but the Panthers quickly tied the game. Every shot Seward would make, the Panthers had an answer. Three straight three-pointers for the Saints should have put them up big, but they held just a two-point lead at the media timeout due to three straight three-pointers by Neosho. Though the Saints pushed the lead up to four points with just under six minutes to play, Neosho kept the game from getting out of hand, eventually taking the lead two minutes later with a Downing floater in the lane. Down 80-78 with 27 second left in the game, Devin Bethely connected on a contested three from the right wing to give the Saints a one-point lead. As the rest of the game went, though, the Panthers had an answer, driving down the court to connect on an and-one play. A missed three by the Saints forced Seward to start fouling. Following missed free throws, Isiah Small had one last chance to tie the game with a half court heave, but it fell harmlessly to the ground, as the Saints were defeated 86-83. Seward shot 54.2 percent (32 of 59) from the floor and 44.8 percent (13 of 29) from behind the arc, but they allowed the Panthers to shoot 48.1 percent (26 of 54) from the field and 46.2 percent (12 of 26) from deep. What ended up being the back-breaker for the Saints was the 22-to-6 free throw advantage that Neosho held over Seward. Ke’Sean Davis scored a career high 27 points on 12-of-15 shooting, while Hegel Augustin (11 pts) and Isiah Small (10 pts) each reached double-figures. Seward will travel to Independence at 6:00 p.m. on Saturday (Feb. 17) to take on the Pirates. Both teams will be fighting to stay in position to host a playoff game as the Pirates are currently the No. 7 seed and the Saints are the No. 8 seed.. Independence will stream the game and it can be heard on 107.5 KSCB with Brock Kappelmann (pxp) on the call.